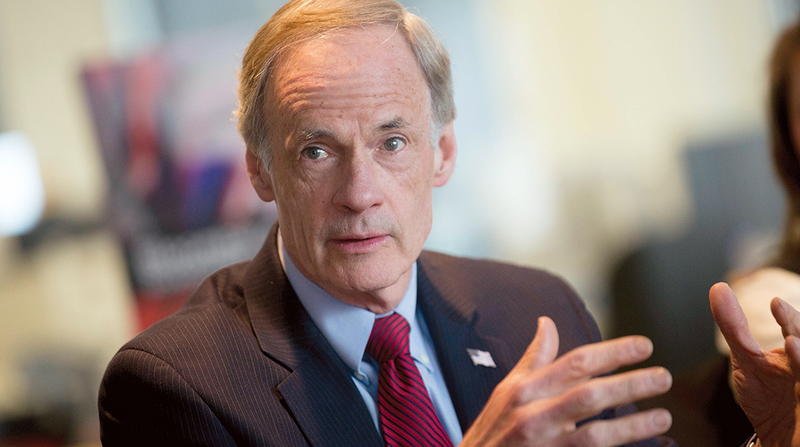 “We must ensure that we are planning and designing transportation systems that are sustainable and resilient to increasingly severe weather and extreme weather events,” said Delaware Sen. Tom Carper, ranking Democrat on the Environment and Public Works Committee, during a hearing with proponents of infrastructure funding. Carper on the same day as the hearing introduced legislation that would authorize grants for promoting electric vehicle charging infrastructure. He stressed to colleagues and stakeholders that the transportation sector is a major contributor of greenhouse gas emissions. Carper is not alone in championing infrastructure resilience policies, which have a chance of adoption in broad legislation this spring. Fellow Senate Democrats, including Massachusetts’ Ed Markey, continue to raise the alarm about the effects of human behavior on the climate. In February, Markey and Rep. Alexandria Ocasio-Cortez (D-N.Y.) unveiled the Green New Deal proposal, which is meant to transform the country’s transportation system. The goal is to minimize the collective carbon footprint nationwide within 10 years. Carper’s Democratic counterpart in the House, Transportation Committee Chairman Peter DeFazio (D-Ore.), said he intends to respond to concerns about severe weather events and climate change in upcoming infrastructure legislation. Meanwhile, Republicans are pushing back on the Green New Deal. Senate GOP leaders coordinated their messaging March 5 to attack the ambitious proposal, claiming it would hinder economic progress. “The Green New Deal continues to be a big green bomb in terms of the issues affecting the American public. I think it’ll blow a big hole in the economy,” EPW Chairman John Barrasso (R-Wyo.) told reporters. Commerce Committee Chairman Roger Wicker (R-Miss.) noted that the Green New Deal’s objectives target non-transportation policy, as well. “It would be easy to dismiss the Green New Deal as an absurd proposal, yet many are taking it seriously,” he said, lobbing specific criticism at provisions that would guarantee housing, health care, high-wage jobs, food and paid vacations for all Americans. Majority Leader Mitch McConnell (R-Ky.) said that in the coming weeks he intends to call up the Green New Deal on the Senate floor. The American Action Forum recently determined the Green New Deal’s cost could be anywhere between $51 trillion and $93 trillion. Douglas Holtz-Eakin, formerly the director of the Congressional Budget Office, is that group’s leader.